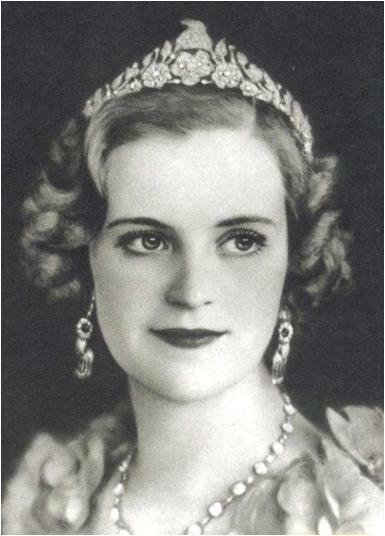 Designed by Marianne Ostier for Oesterreicher jewelers (later Ostier, Inc.), this diamond and platinum tiara was created for the 1938 wedding of King Zog I of Albania and Queen Geraldine. Using approximately 28.05 carats of old European and single-cut diamonds and 4.80 carats of baguette diamonds, the design features a graduated floral base topped by a stylized diamond ram's head. That's right, a ram's head. It's a goat tiara. If you're thinking huh? !, I wouldn't blame you; the ram's head is definitely one of the stranger tiara motifs we've seen in five years of Tiara Thursday features. When you start to dig into the background of the tiara and the people it was created for, however, it starts to make a little more sense. King Zog was Ahmed Bey Zogolli, later Ahmed Zogu, the leader of Albania from 1925 to 1939. He was president of the country before creating a throne for himself as King of the Albanians in 1928. (Though he proclaimed it to be a constitutional monarchy, his powers inched it more towards a dictatorship.) He fell in love with the half-Hungarian, half-American Countess Geraldine Apponyi de Nagy-Apponyi when he saw her in a photograph, and they were engaged just a few days after meeting. 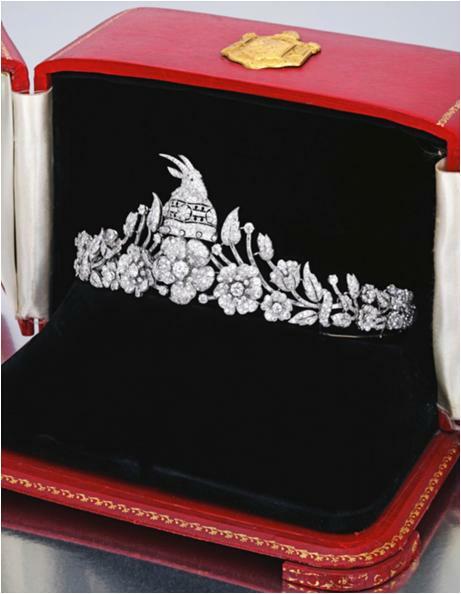 The white roses on the base of the tiara tied it to Queen Geraldine, who was known as the "White Rose of Hungary". The top tied it to King Zog, as the ram's head is a heraldic symbol of the Albanian royal house. 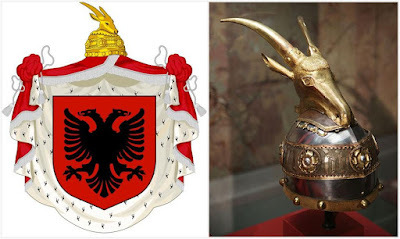 It is also a symbol associated with Skanderbeg, the fifteenth-century warrior and nobleman who fought to defend Albania and who is often referred to as Albania's national hero. King Zog claimed to be a successor to Skanderbeg, adding to the reasons to emphasize the ram's head symbol, even in a tiara. Use of heraldic motifs in tiaras is not so unusual. Selecting a mammal from those motifs for your tiara is a bit more unusual. Most unusual of all is the Albanian royal family's firm commitment to the ram's head motif: it appeared in jewels for King Zog's sisters, and the family also had a sapphire and diamond goat tiara (see here and here). The version made for Queen Geraldine seems to have been a bit subtle in use, really just a pretty floral tiara with a center that requires closer viewing. The reign of King Zog I didn't last long after the wedding. Italy invaded Albania in April 1939, just a year later and just days after Queen Geraldine gave birth to a son, and they fled into exile. Some of the jewelry was eventually sold, most notably in 1959 sale. In 1966, Geraldine's Diamond Tiara was purchased by American pharmaceutical executive Elmer Holmes Bobst. He bought it for his wife, Mamdouha, to wear to a White House reception where he was to be honored. She was the owner of a fascinating jewelry collection that included other pieces by Marianne Ostier. Mamdouha Bobst passed away in 2015. Some of the Bobst jewels, Queen Geraldine's Diamond Tiara included, will be offered at the Magnificent Jewels sale at Sotheby's in New York on April 19. 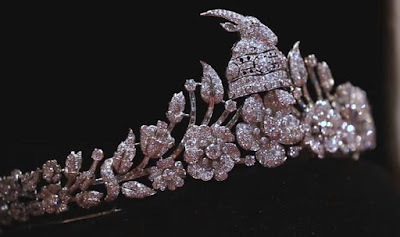 The tiara's estimate is $30,000-$50,000. See the lot at Sotheby's here, including a photo of Mrs. Bobst wearing the tiara. What say you: intriguing in a good way, or not so much?